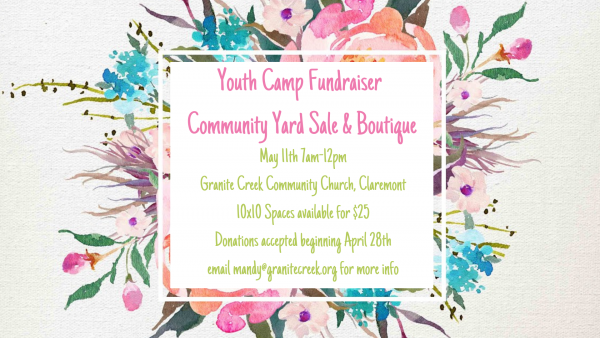 This event is being hosted by Granite Creek Community Church to benefit the youth group's trip to Angeles Crest Christian Camp this summer. Tear Down: all items must be removed after the event. If there is a donation pick up available after the event, you will be notified via email. You will be responsible for bagging and boxing all items to make them eligible for pick up. All donations must be received with your application to reserve a spot. All rented 10x10 spaces will be outside in our parking lot. Vendor is responsible for tables, chairs, shade, power strips, 50-foot extension cords, etc. Electricity will be provided if requested during application process. Applications will be accepted on a first-come, first-served basis or until spots are filled. The Event Manager is not responsible for monitoring or to guarantee exclusivity on merchandise sales. Vendors are responsible for collecting and reporting sales tax. You will be responsible for providing the labor needed for all your items related to the setup and breakdown of your booth space (tables, chairs and materials, etc.). All spaces must be left in the condition they were in at the beginning of the event. No stolen merchandise, fire-arms, ammunition, explosives, alcoholic beverages, drugs or illegal items are permitted on the church grounds. Additional Information regarding the day of schedule will be sent to you via email upon acceptance. WAIVER OF LIABILITY: I agree to indemnify and hold Granite Creek Community Church, their officials, staff and agents harmless of and from any and all actions, causes of action of every kind in law or equity, suits, debts, liens, contracts, agreements, promises, claims, liabilities, demands, obligations, loss, costs and expense of any nature whatsoever, known or unknown, fixed or contingent, including, without limitation, attorney’s fees and court costs through and including any appeals, taxable or otherwise, incurred, either directly or indirectly, as a result of my participation in the community yard sale boutique, including but not limited to, any claims which might be made by myself, my co-workers, my agents, my employees, and/or any member of the general public. I understand and agree that Granite Creek Community Church is in no way responsible for my property/or its safety. ACKNOWLEDGEMENT OF RESPONSIBILITIES: I agree to leave my space the way it was given to me. If anything happens to my space, I will notify an Event Manager. If my product causes damage to any property at Granite Creek Community Church, either myself or my insurance will cover the cost of the damages. PROMOTION PERMISSION: I grant permission for Granite Creek Community Church to use photos of me and my products with or without my name and for any lawful purpose, including, for example, such purposes as publicity, illustration, advertising, and Web content unless otherwise noted. Thank you for applying! You will receive additional day-of event information shortly!